Last year I shared seven end-of-the-year teacher gift ideas. This year I don't have nearly as many, but this one is fun, easy and inexpensive — altered bitty bag gift card holders. 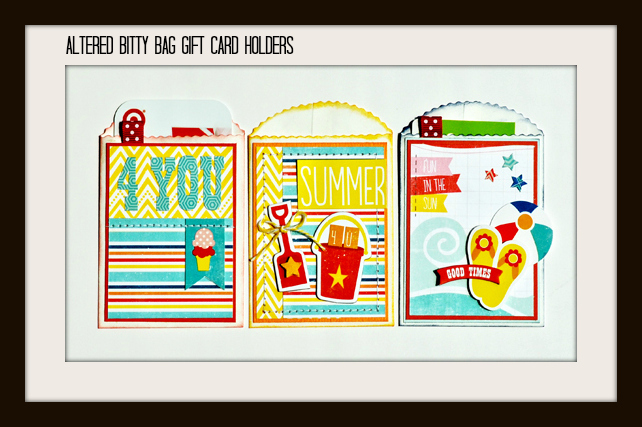 These bags are the perfect size (about 2 1/2" W x 4" H) for a gift card and a thank you note too. They're made by Canvas Corp., come in packs of 25, and can be found at Hobby Lobby. 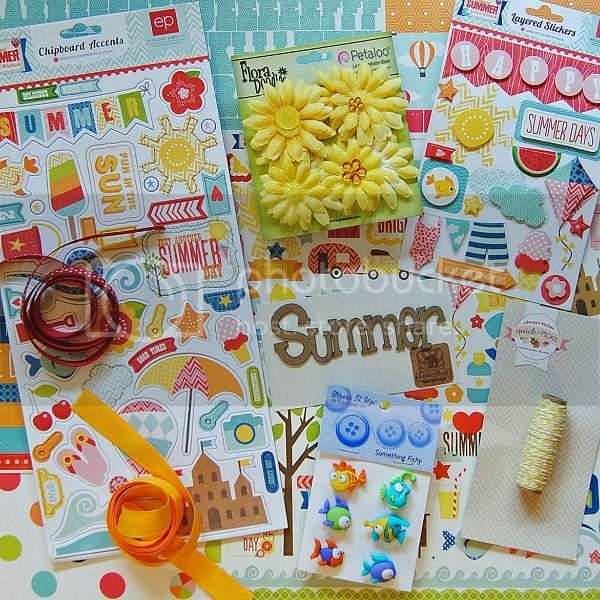 To create these, I used the June kit from My Creative Scrapbook (pictured above) to make what are basically mini layouts. After matting each "scene", I adhered the finished piece to the front of each envelope. What is your favorite, go-to teacher gift idea? If you are fresh out of ideas, or need some inspiration, I've added a "teacher gift" tab to the home page of my blog. You'll find links there to posts I've done about teacher gifts. ok talk about cute cute cute!! i love it! Love these. Super duper cute. A fun and practical idea. Great gift card holders. Wowwwwwwwwww! These are beautiful!! I am LOVING the colors!!! LOVE those jazzed up bags! what a cute idea for any holiday! I saw these in the Two Peas gallery and they immediately caught my eye! Love the bright colors, what a great project. so so cute Lisa!!! so bold... love those colors! I just saw these on 2peas and love the bright colors! Such a fabulous idea!! Love the bright colors = so fun!! Fun colors!,, Great decor project!! Love these dressed up bags! Perfect! So cute!! Love the products you used! Those are so cute, and a great idea! I just stuck our gift cards for the teachers in the cards you saw on my blog today. But I think next year I am going to try the bag idea! These are just adorable!!! Such a cute idea, love it!! Love the bright colours! Thanks for the inspiration - I'll be lifting this idea! These are so adorable, Lisa!! Love them!! These are really adorable! Love the idea and the happy colors!